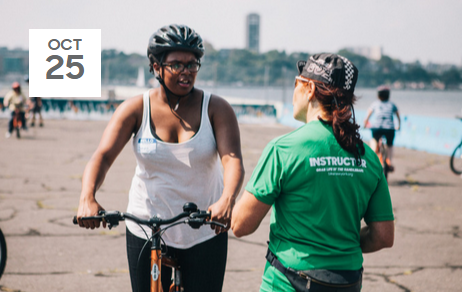 Learn to Ride—Adults is a free class for adults and mature teens who are ready to ride. Doesn’t matter if you’re 18 or 80, we’ll get you rolling in no time. With our safe, easy, effective method, Learn to Ride students learn how to balance, pedal, start, stop, and steer a bike, as well as adjust a helmet for proper fit. Most people learn to ride in one session, but even if they don’t, they’ll leave equipped with an easy, low-stress way to teach themselves—or, they can join us for another free class! Equipment: Bicycles and helmets provided to those who register online for the class*. Registration policy: Advance registration is preferred; walk-up students are accepted as space allows. *Anyone who chooses to bring their own bicycle must ensure that the bicycle fits and is in good working order (i.e., wheels spin freely, brakes function).